Welcome to the website of pianist, composer and conductor Adam Swayne. A versatile and eclectic musician, Adam studied at the University of Manchester and the Royal Northern College of Music before completing his doctorate as a Fulbright Scholar at Northwestern University in the U.S.A. His principal teachers were Ursula Oppens, John Gough and John Casken. Through regular concert appearances, pioneering research and new compositions, he continues to create and present unfamiliar music for all kinds of people. 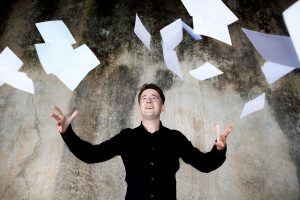 Adam Swayne is Lecturer in Music at the RNCM and Pianist and Programme Director for the Riot Ensemble. He has been described by The Times as ‘a pianist of formidable technique and high intelligence’ and by the Evening Standard as ‘an ideal blend of panache and subtlety’. Live from the CoMA International Festival of Contemporary Music at the University of Bangor in 2012, Adam performs ‘Count Me In’, a theatrical work for piano and electronics composed for him by Dr Kevin Malone of the University of Manchester in 2005. Video by Chris Adams.